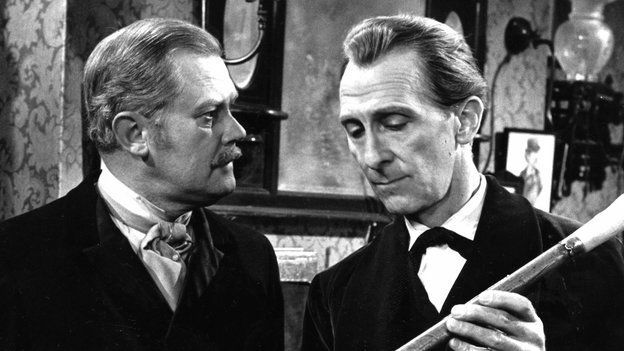 Peter Cushing and Nigel Stock were to portray Sherlock Holmes and Dr. Watson for 16 episodes of Sherlock Holmes on the British Broadcasting Corporation (BBC) in 1968. Stock had portrayed Watson in the first 13 episodes of the series in 1964 and 1965, with Douglas Wilmer portraying Holmes. Cushing had starred as Holmes previously in the 1959 horror film adaption of The Hound of the Baskervilles and would resurrect the role again in the 1984 film The Masks of Death. 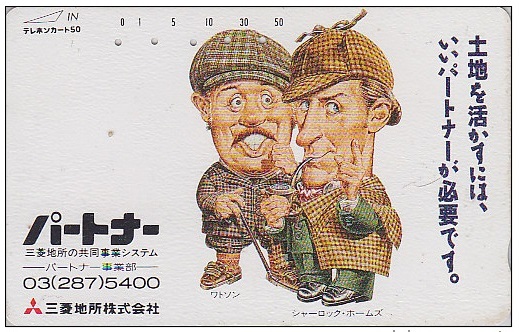 Your editor would be very grateful to be contacted by any Japanese Sherlockians, who could translate these and other Japanese phone cards.